old days of weight training, bodybuilders just bought powdered milk and doubled up the servings. This creates a cost-effective post-workout supplement. Yes, some other ingredients are needed in the mixture to improve flavor and texture, but a high quality protein smoothie at a rock bottom price was yielded nonetheless. Over two and a half decades later, it turns out there might have been more benefit in his advice than mere thriftiness. While it’s been debated which form of whey protein is best, or whether any form is better than casein, it might just be that the whole, fatty, creamy milk discharged from ‘Betsy-the-cow’ is as good or better a post-workout meal than either of those parts. The entire “what do I eat post-workout” question became somewhat a dismissible topic to me long ago. That began with my being young and emotionally engaged in bodybuilding when product marketers saw post-workout-specific supplements as an opening to get their consumable products, well… consistently consumed. What could be better for the purpose? Convince young and eager muscle building guys that there’s a narrow “window of time” in which specific nutrients need imbibing so as to maximize muscle recovery and growth. It sells products that are otherwise non-addictive. You don’t need to convince me to drink my cup of Starbucks (I’m addicted). But there are no physiological factors for getting hooked on whey protein; only psychological beliefs. I’m not knocking this, nor am I implying there aren’t some benefits to selective post-workout nutrient intake. But in hindsight, I think the benefits have been exaggerated, which is my sole purpose in prefacing this with a bit of personal pragmatic perspective. In my youthful enthusiasm, I tried many post-workout nutrient intake tactics. The variance in outcomes for me has never warranted putting it in that 20% of input that generates 80% of success. Maybe that will change with my current experiment. I’ve finally come full circle. 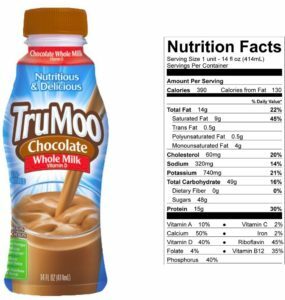 After avoidance of whole milk since I was, oh… probably ten years old, I’m drinking a ‘Tru-Moo’ chocolate whole milk immediately following every bodybuilding workout. If you’re interested, here’s how that came about. The most advanced form of my bodybuilding strategy includes workouts done in a low glycemic state. This is a technique I’ve built up to and don’t recommend for beginners or many intermediate trainees. It’s been highly effective for me, however, from the standpoint of muscle growth and the fat loss that only extreme insulin sensitivity provides. Following a workout like this by drinking a high calorie, easily digestible meal (smoothie) is almost impulsive; it just happens. But too many calories hitting an empty system can cause temporary shutdown. I was reminded of that recently following one of my most extreme workouts. Over a thousand calories from a blender literally shut my brain down for 15 minutes of what felt like a metabolic knockout punch. Next time I did THAT workout, a convenience store was calling my name after I left the gym parking lot. Upon entering the store, I moved as if in a fog to the milk section. ‘True-Moo’ chocolate milk was what I grabbed, a 14 oz. bottle of the whole milk variety being the only available. Let’s look at the macronutrient breakdown. Being whole milk, it’s obviously high in fat. What some people might balk at is 81 of those 126 fat calories are from saturated fat. That’s high as a percentage of this small meal (21%). However, it’s low in absolute terms or relative to my potential daily intake. If I drink this post-workout while keeping the remainder of my day’s meals low in saturated fat, I could still come in below what even the AHA recommends for SF. There are definitely enough carbs to start re-synthesizing depleted muscle glycogen. What’s questionable to some (and again, worthy of hesitancy) is whether most of that is from high fructose corn syrup (HFCS). For me personally, the infrequency of my workouts (and thus, ‘post workout meals’) puts this at a low absolute intake of HFCS despite the possibly high relative amount in this drink. Fifteen grams of protein might sound low to many bodybuilders. But this could be a perfect number within the first hour post-workout. Aside from the benefit of not bombarding a calorie depleted body with too many calories at once, there’s evidence that a lesser amount of protein from whole milk might be more ‘anabolic’ than a greater amount from milk with reduced fat. This was shown in a study designed to determine the response of net muscle protein balance following resistance exercise to ingestion of nutrients as components of milk. The results revealed that phenylalanine and threonine uptake (indicators of ‘anabolic response’) was greater after the ingestion whole milk compared to fat free milk. This happened despite the fat free milk containing a higher amount of protein. In conclusion, I consider ‘chocolate milk as a post workout drink’ to definitely be a partial and transitional meal. But its ingredients appear to run parallel with (and often exceed) the more expensive “anabolic” drinks on the market. And I’ll let you know if that whole milk delivery of protein ends up showing more anabolism in my workout progress.